Summer cooking is all about fast and fresh, but now we're ready to slow things down to cooked and comfortable for the cooler months. The coming months mark the beginning of comfort food season with crusty casseroles, cheesy-baked pastas, warmly stacked lasagnas, and much more. And, even though we are definitely ALL about a dish that tastes slow-cooked, the idea of finding all that time to spend in the kitchen makes us want to go out to eat. So, what's a big comfort food-lover with little culinary patience to do? Just sheet pan it. No matter what your favorite slow-simmered, crusty-roasted, or cheesy-baked dish may be, a far less time-consuming cooking option is closer than you think. Thanks to Raquel Pelzel's Sheet Pan Suppers Meatless, all you need in order to take your go-to cozy recipes from sloth-speed to one-and-done is to throw those suckers on a sheet pan. Happen to be a mac n' cheese fanatic? No problem, Pelzel has your speedy sheet-mac covered. What about Garfield's go-to, lasagna? Yep, that can be slapped on a pan, too. 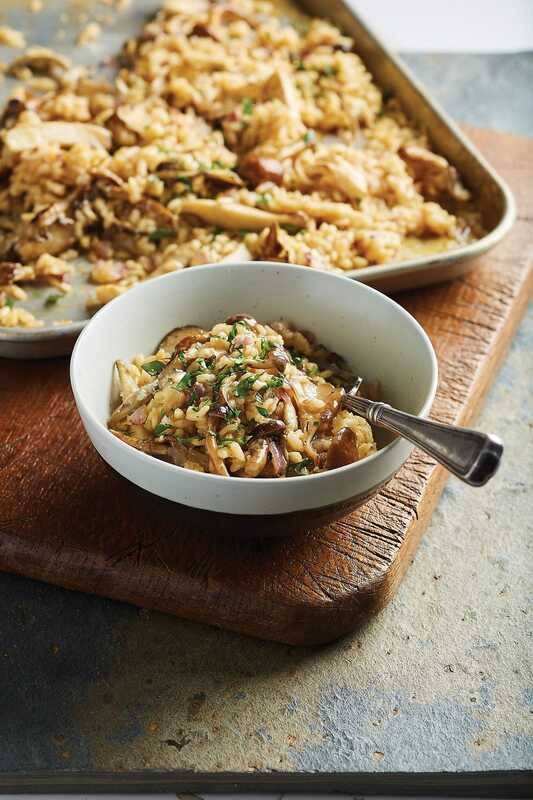 Not even risotto, the slowest-cooked comfort food of all time, can escape the fast- and fool-proof sheet pan solution. Don't believe us? Scroll ahead to get the scoop on all of Pelzel's creative takes on our comfort food favorites. 1. Adjust an oven rack to the middle position and preheat the oven to 375°F. 2. Grease a rimmed sheet pan with the room-temperature butter and set aside. Combine the bread crumbs and Parmigiano Reggiano cheese in a medium-size bowl. Stir in the melted butter and set aside. 3. Whisk the whole milk, evaporated milk, cream, onion, garlic powder, salt, and the Cheddar and fontina cheeses in a large bowl. Add the uncooked macaroni and stir until well coated. Pour the mixture into the prepared sheet pan, spreading it in an even layer. Cover the sheet pan with aluminum foil (you may need 2 sheets), crimping it tightly around the edges to seal (make sure to get a good seal on the foil, otherwise the pasta won’t cook). Bake for 25 minutes. 4. Wearing oven mitts, remove the foil and stir the macaroni. Sprinkle the bread crumb mixture over the top and continue to bake for 25 minutes more. 5. 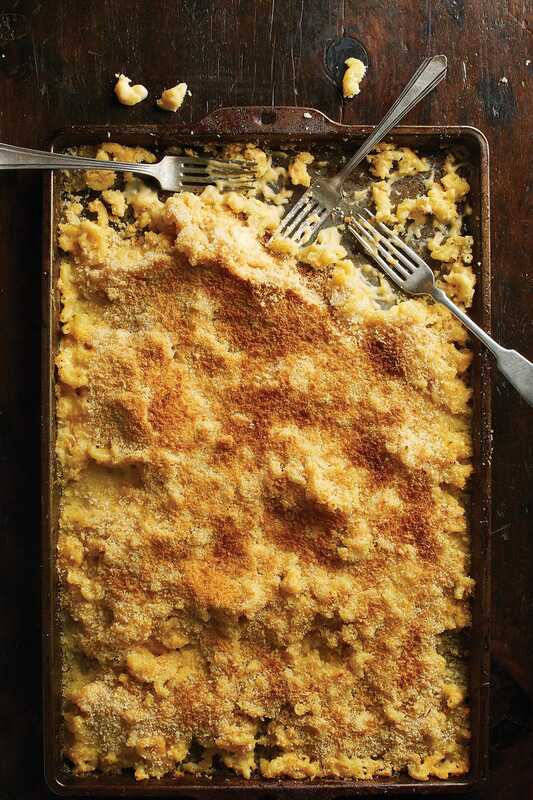 Turn the broiler to high and broil the macaroni and cheese until it is golden brown on top and bubbling, about 10 minutes (watch the macaroni and cheese closely as broiler intensities vary). Remove from the oven and let the pasta stand, covered, 5 minutes before serving. 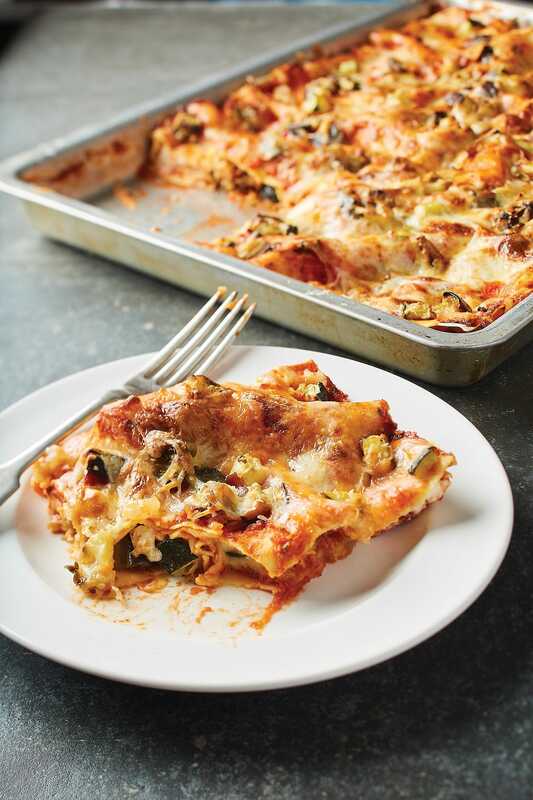 Photo: Courtesy of Sheet Pan Suppers by Raquel Pelzel/Workman Publishing. 1. Adjust an oven rack to the middle position and place a large sheet of aluminum foil on the rack below it to catch any drips from the pan above. Preheat the oven to 400°F. 3. Reduce the oven temperature to 375°F. Place 1 cup tomato sauce in the bottom of the sheet pan you used to roast the vegetables and spread it out evenly with a spoon. Place enough sheets of pasta in the bottom of the sheet pan to form a single layer. (It’s okay if they overlap slightly; for a 10 x 16-inch pan you’ll use 6 sheets of pasta.) Spread another cup of tomato sauce over the pasta evenly. Sprinkle half the vegetables over the sauce followed by half the mozzarella cheese. Dollop heaping tablespoonfuls of ricotta cheese over the mozzarella. (It will spread during cooking.) Use all the ricotta in this layer. 4. Add another layer of pasta sheets, the remaining cup of tomato sauce, the remaining vegetables, and the remaining mozzarella cheese. Sprinkle the Parmigiano Reggiano cheese over the top. Bake until the cheese melts, about 25 minutes. 5. Preheat the broiler to high. Broil the lasagna until the cheese is browned, 3 to 5 minutes. Remove from the oven and cool for 5 to 10 minutes to firm up slightly before slicing. Sprinkle with the basil and serve. I Can’t BelieveIt’s Mushroom Risotto! 1. Adjust an oven rack to the middle position and preheat the oven to 400°F. 2. Place the mushrooms, red onion, garlic, olive oil, and salt in a medium-size bowl and toss to combine. Turn the mixture out onto a rimmed sheet pan and roast, stirring midway through cooking, until the mushrooms are browned, about 20 minutes. 3. Stir the wine into the mushroom mixture and return the pan to the oven for 5 minutes. Wearing oven mitts, pull the oven rack out partway and stir in the rice. Slide the rack back into place and continue to bake for 5 minutes. 4. Pull out the oven rack partway again and stir 1 1/4cups broth into the rice. Carefully slide the rack back into place and bake until the liquid is mostly absorbed, about 8 minutes. Pull out the oven rack partway and stir in another 1¼ cups broth. Carefully slide the rack back into place and bake for 5 minutes more (the rice will start to look more cooked and starchier). Pull the rack out partway once more and carefully stir in 1 cup broth. Bake 5 minutes, then stir in the remaining cup of broth. Bake until the rice is no longer opaque and is tender yet slightly al dente, about 5 minutes more (total cooking time after stirring in the first addition of broth is about 25 minutes). 5. Stir in the butter followed by the Parmigiano Reggiano cheese. Taste and add salt and pepper as needed. Stir in most of the parsley and sprinkle a little over the top before serving. This article was written by Elizabeth Buxton from Refinery29 and was legally licensed through the NewsCred publisher network. Please direct all licensing questions to legal@newscred.com. What's not to love about a sheet pan meal? Simple ingredients. Bold flavors. And super-easy prep and cleanup. From chicken to salmon to shrimp, we're Team Sheet Pan all the way! Try: Sheet Pan Chicken Fajitas, Sheet Pan Shrimp Scampi or Orange Chili Sheet Pan Salmon tonight.